The following steps illustrate how to search in eHRAF World Cultures for results pertaining to the theme “hunting whales with weapons” (without specifying any culture name or region). For this search, begin with on the Advanced Search page in the eHRAF World Cultures database. You will be shown how to use “Add Subjects” and “Add Keywords” on the Advanced Search tab. Click on “Add Subjects” to open the subject selection menu. a. Click on A-Z index and enter the term “whaling” into the Filter Index box (see what this looks like). c. Click on OCM Code (pictured below). Then click on the 200-299 OCM Code range to browse by OCM and select “Food Quest” and the relevant OCM codes as described before in option b. Note: Use a check mark to select subject and click on the 3-digit OCM number to view a description of the OCM subject. Because you are looking for results pertaining to the subject of hunting “whales”, you’ll need to add additional keywords to your search to refine it to that specific aspect of marine hunting. Tip: To return the most results, truncate your keywords at the word stem. For example: whale* whaling* orca*. Using an asterisk “*” retrieves various endings (e.g. whale* for whale, whales). Be sure to separate the keywords with a space. 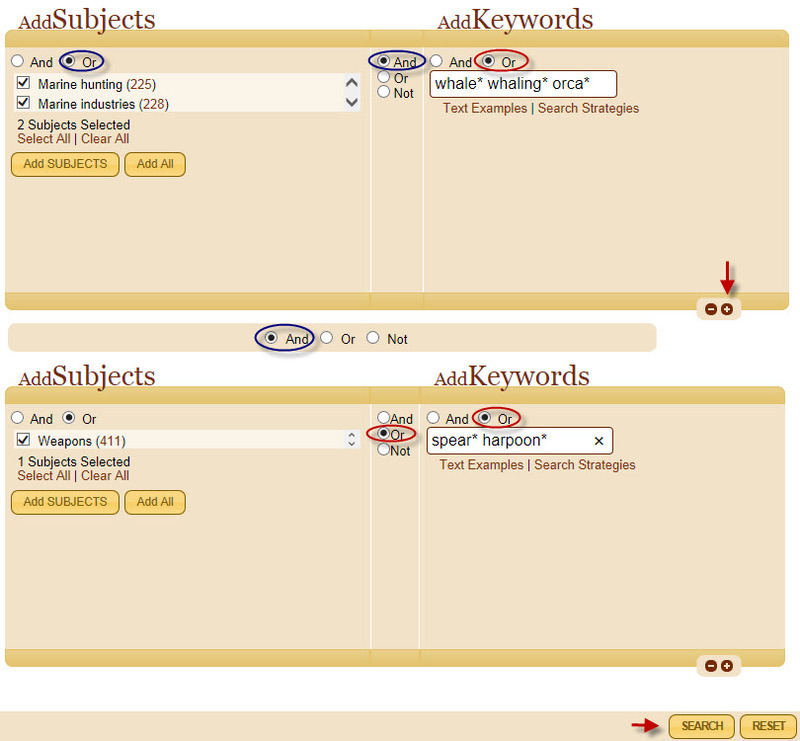 Click the + in lower right hand side to add more subject and keyword terms. a. In the A-Z Index tab, enter the word “weapons” into the Filter Index box. b. In the Major Subjects tab, select “Technology and Material Culture”, then “Tools and Appliances”, and then Weapons (OCM 411). c. In the OCM Code tab, navigate to OCM 411 in the range to find “Tools and Appliances”. Step 7. Set your Boolean operators! Be sure to select the radio buttons for the Boolean operators (AND and OR) correctly throughout the search page. Step 8. Use “Search” button to launch your power search and review your results. If you are not yet a member and want to try your own eHRAF Advanced Search in eHRAF World Cultures, contact hraf@yale.edu for a current login.